Referencing – With a looming deadline – What do I do?! You can check places like the course handbook or the library pages at Goldsmiths to know what scheme you need to use. If you are doing units from several departments, double-check what scheme your departments require. Inconsistency sticks out like a sore thumb and please don’t forget to do a CTRL+F search of a bracket ( and double check all citations in the text. Are they all in your references list? Referencing is enough of a pain in the neck without having to check the pages you got a quote from after the fact. You may think you have cracked it when you come across something in Google Books (when the physical copy is on loan) but make sure you have the right edition. Corroboration is your objective. Nothing else. It’s okay to be a technophobe. If you don’t want any technological assistance, you need to make sure you keep paper records. Shoe boxes are great places to archive your materials and the print outs of journal articles and weblinks need to include where they are from. When it comes to a bunch of pages from a book that you stapled together, write down the reference or at worst the ISBN of the book and pages used. Omitting the pages of a journal article, mistaking an editor of a book with the author of a book chapter and not including the edition of a book come to mind. When it comes to weblinks, make sure you include the date you accessed these things (and if in a rush make it the date of the deadline). The more diverse the source, the more time it takes. The classic referencing schemes were created for print materials. Managing digital sources is fiddlier as you need to include more information detailing where you got the information. There are also visual sources and performances. If this is what you are coming across, look for an authoritative referencing guide (and read on). All universities like to tweak their own version of Harvard, so using the guide from another university means that you inherit their quirks. Also be mindful that a guide might be easily accessible but also be out of date. A personal bug bear is students thinking the solutions they find on the Internet can do everything. They don’t. Generally they work best for established referencing schemes and for conventional academic materials. Goldsmiths (like other university libraries) look after their own first. You have never had it so easy with Zotero and the magic wand! As a library we push Zotero (rather, we do lots of training sessions in how to use it). It’s free and easy to use if you are prepared to make the commitment. It’s also super speedy to recover your references when they are books or journal articles. All you need to do is type in the ISBN or DOI where there you see the magic wand icon. With all of the references you cited stored in Zotero, you can then produce a references list. It is imperative that you go into your Preferences, select Cite and select the appropriate scheme for your assignment. I’d remove the schemes Zotero thinks you need and make the most of ‘Get additional styles’. For those using Harvard, make sure you select ‘Cite Them Right 10th edition – Harvard’. Can Zotero really let you cite while you write? Yes, it can do that too (plus lots of other fancy things) but when in a rush, focus more on getting things right rather than learning too many things. If you want to know more, the library regularly do sessions and you can always ask them. They are happy to support. The Library is offering a series of Summer workshops which any Goldsmiths student can attend. This session will focus on finding resources, including peer-reviewed journal articles, for your research and other academic assignments. The session will cover skills applicable to a wide range of disciplines, with a focus on social science resources databases such as PsycInfo, Sociological Abstracts, and JSTOR. A refresher workshop on referencing with a focus on Zotero, which is free, online referencing software that is particularly useful for organising references for a longer assignment, project or dissertation. This session will focus on finding resources for your research and other academic assignments. The session will cover skills applicable to a wide range of students, with a focus on arts and humanities databases such as Art Source, Literature Online and JSTOR. There are few more frustrating things for researchers than finding a fantastic piece of research and then being shut out of reading it by a paywall. If your university library doesn’t subscribe to that particular journal, you might just give up, assuming you can’t get access. However, there are a couple of tools out there that might be able to help you get free, legal access to paywalled articles. Open Access Button is a free, open source tool that can be used online via the website or as a browser extension for Chrome or Firefox. If you’re online, just enter an article URL, DOI, PMID ID, Title or Citation. Unpaywall is a newly launched browser extension developed by Impactstory, a service that provides altmetrics to researchers, helping them measure and share the impacts of research outputs – not just traditional forms of publications such as journal articles, but also datasets and blog posts – where measuring impact has always been trickier. The browser extension can be downloaded for Chrome and Firefox and allows you to find free, full text versions of articles, where they exist, with one click. LSE Impact Blog recently ran a piece on Unpaywall and its objectives, but it also provides a brief overview of the tools that are available to unlock research. For example, if you search on PubMed, there’s a LinkOut option, which finds copies of articles in institutional repositories. Recent articles in Nature and The Chronicle of Higher Education also highlight the benefits and successes of these tools. So next time you find an article and you’re being asked for extortionate sums of money for access, try Open Access Button or Unpaywall. From 1 April 2016, HEFCE will require that any peer-reviewed research article or conference proceeding with an ISSN must – to be eligible for REF2021 – be deposited into an institutional repository (i.e. Goldsmiths Research Online, GRO) and made Open Access. 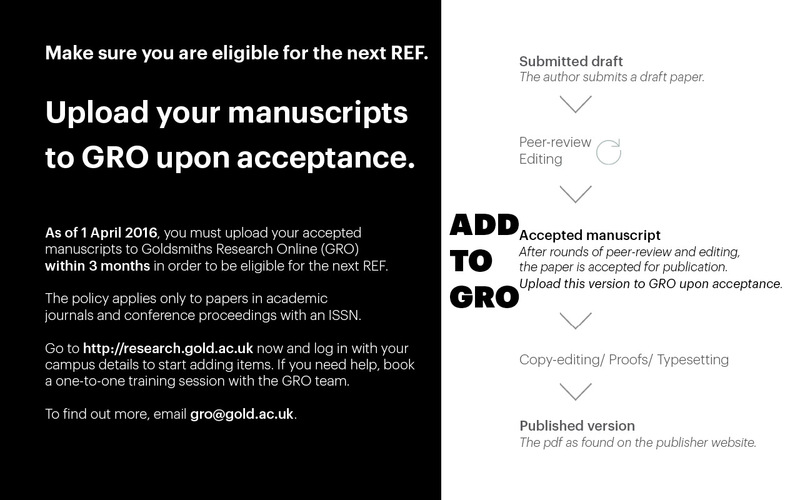 In order that we send out useful, consistent and ultimately compliant information, Goldsmiths requires from now that all research active staff add their manuscripts (peer-reviewed research article/conference proceeding with ISSN) to GRO within 3 months of the final acceptance date. What needs to be deposited into GRO? What assistance is there to help staff? This week (30th November – 4th December), we are running a series of drop-in sessions in the library where students can prepare for writing essays by learning about how to search for information more effectively and how to reference their work. We’re also letting you know which other libraries you can use, how our Special Collections and Archives can help with your research and offering advice on presenting with confidence. To help you further, there are a range of books in the library that will supplement what you could learn in these sessions. If you’re not sure how to structure an essay or how to avoid plagiarism, then these books can really help. The 808.02 section on the second floor has a number of books on academic and study skills. Here are just a handful which are worth reading. Each website has a mix of news, opinions, features, job adverts, events and more. Browse between sections or use the search to find something specific that interests you. To access these websites, you must first register using the ‘sign in’ option. Create an account using your Goldsmiths email address (a personal email address won’t work). Once you’ve registered, you’ll need to follow the instructions in the verification email Brand Republic sends you. Changing between websites is easy – scroll all the way to the bottom of the page and choose another website in the Brand Republic network. The Library is running information skills sessions across the academic year, designed to support your studies and help you prepare for assignments and exams. If you want to learn how to use online software to make referencing simple, how to search for peer-reviewed journal articles, how to access other libraries in London and the UK, how to use our Special Collections and Archives, how to find online newspapers or video, how to use our online reading lists system or even how to confidently present your work, then we’ve something for you and you’re more than welcome to attend. No need to sign up in advance. If there’s a session you like the sound of, just turn up. Please check the dates, times and rooms of sessions – most are in IT labs in the Rutherford Building (ground and first floor), but some are in Special Collections (ground floor) or the Prokofiev Room (second floor). Each session lasts 45 minutes to an hour. What is a ‘special collection’ or an archive? The Goldsmiths online reading lists system shows the real-time availability of items in the library; as well as linking directly to online resources such as ebooks and journal articles. This session will show students how to access the reading lists system and online resources both on/off campus, and the functionality of the reading lists system. You can see which events are taking place or what people on saying on Twitter using #npm15. Although an American event, if you want to learn more about how poetry is celebrated in the UK, have a look on the Poetry Society’s website. We also have databases that have a comprehensive amount of poetry, including LION, where you can search or browse by author or text to find the full text of poems. You can also see clips of poets reading their own works and the works of others. Goldsmiths’ own Blake Morrison reads his own poetry here. There’s also an audio archive of poets reading their works too. 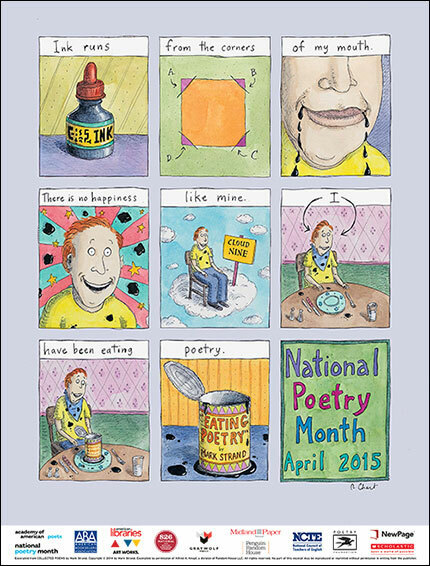 Why not take a short break from your studies and discover some new poetry? 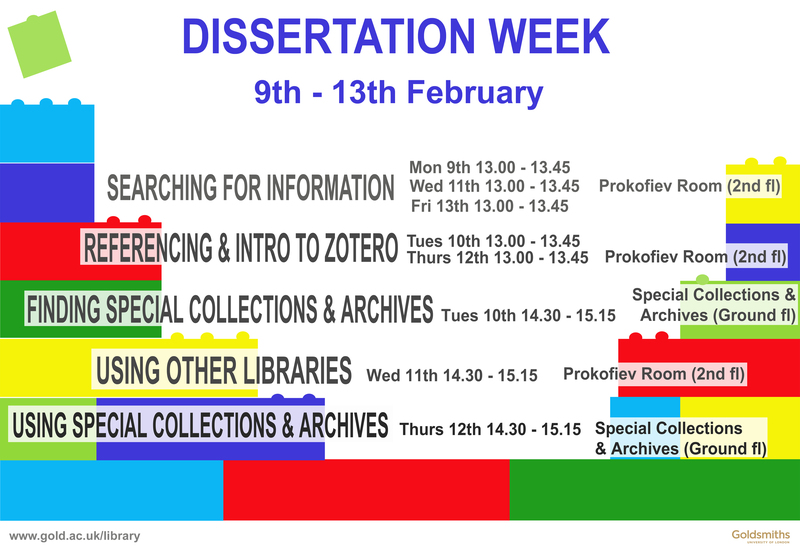 This week (9th-13th Feb) we have a series of lunchtime and afternoon sessions designed to help students who are about to start their dissertations, although anyone can attend, so it doesn’t matter whether you’re a first year undergraduate student or a postgraduate. There’s no need to sign up in advance; just come along to the session you’re interested in. For advanced tips for searching the library catalogue, effective database searching and searching alternative formats. An introduction to Zotero (free, open source online referencing software). Bring a laptop if you can! What are Special Collections? How to find the collections and archives you need. Goldsmiths students are eligible to use other libraries in London and the UK. Find out how. How can these contribute to your research? This is a hands-on workshop with items from our collections. Do you know about the Goldsmiths’ online Reading Lists System? The online Reading Lists System was launched in September 2014. Currently we have around 300 reading lists available online. The system website is http://readinglists.gold.ac.uk and it can also be accessed via learn.gold, the library catalogue and the library web pages. The online Reading Lists System enables students to access their reading lists online. It shows the real-time availability of items in the library; as well as linking directly to online resources such as e-books, journal articles, audiovisual items such as DVDs, blogs and even Youtube clips etc. It provides simple access to course reading materials, and students can easily identify essential readings, recommending readings materials for each topic/week/course. If you don’t find a list on the system for your course, it is possible that your lecturer has not set one up; ask them in the first instance. Not all lecturers will choose to place their lists here.